NHL: Rob Schremp and Blake Wheeler scored for Atlanta in the shootout, giving the Thrashers a crucial 4-3 victory over the visiting Philadelphia Flyers after squandering three leads Thursday night. 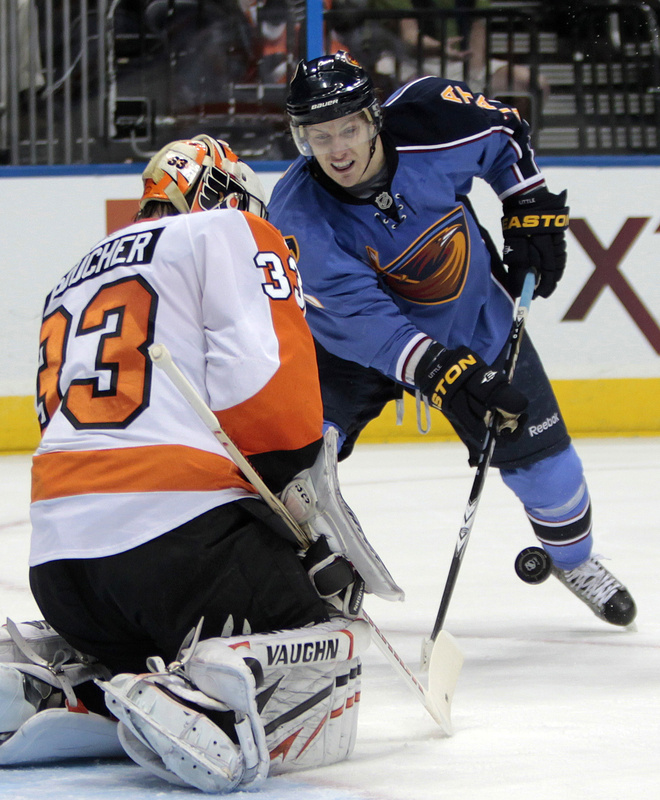 The Thrashers closed within four points of the eighth-place Buffalo Sabres in the playoff race with their second win in six days over the Eastern Conference-leading Flyers. Atlanta will face Buffalo on Saturday. Danny Briere scored two goals, including a tying shot with 1:17 left in regulation for the Flyers, who overcame three one-goal deficits. • Red Wings’ MacDonald earns second shutout: Recently recalled Joey MacDonald made 37 saves for his second NHL shutout, and Drew Miller and Valtteri Filppula scored first-period goals to lift the Detroit Red Wings past the Columbus Blue Jackets 2-0 in Columbus, Ohio. The Blue Jackets have lost nine of 10. • Panthers cruise past Maple Leafs: Sergei Samsonov and Stephen Weiss each had a goal and an assist, and Scott Clemmensen stopped 24 shots for his first shutout of the season to help the Florida Panthers beat the Toronto Maple Leafs 4-0 at Sunrise, Fla.
• Stars recall Segal: The Dallas Stars recalled right wing Brandon Segal from Texas of the AHL Stars for Thursday night’s game against the Chicago Blackhawks. Segal had to clear re-entry waivers before he could rejoin the Stars. Segal played in 36 games for the Stars earlier this season, posting four goals and five assists. NBA: Toney Douglas tied a franchise record by making nine of the New York Knicks’ franchise-record 20 3-pointers, scoring 29 points in a 120-99 victory over the visiting Memphis Grizzlies that snapped a three-game losing streak. Carmelo Anthony scored 28 points and Chauncey Billups added 18 for the Knicks. Mike Conley scored 16 points for the Grizzlies. • Cavs no match for Blazers: LaMarcus Aldridge had 20 points and 11 rebounds before heading to the sideline late in the third quarter, and the Portland Trail Blazers routed the visiting Cleveland Cavaliers 111-70. Portland led by as many as 44 points while easily surpassing its largest margin of victory this season. Gerald Wallace added 17 points for the Blazers, who had 29 assists compared to Cleveland’s total of six. The Cavaliers’ Ramon Sessions had 14 points. • Rose helps Bulls to eighth straight win: Derrick Rose scored 21 points and the Chicago Bulls extended their longest winning streak in six years to eight games with an 84-73 victory over the New Jersey Nets at Newark, N.J.
Luol Deng added 19 points for the Bulls, who took a half-game lead over idle Boston in the race for the best record in the Eastern Conference. Rookie Omer Asik added 11 points and a career-high 16 rebounds. Brook Lopez had 22 points for New Jersey. Miscellany: Paul Casey played bogey-free on the tough Copperhead golf course at Innisbrook in Palm Harbor, Fla., for a 7-under-par 64 that gave him a two-shot lead after one round of the Transitions Championship. Spokane native Alex Prugh shot an even-round 71. • NCAA denies Ohio State’s suspension appeal: The NCAA denied Ohio State’s appeal on behalf of five Buckeyes football players who will be suspended for the first five games of the 2011 season for selling autographed memorabilia and receiving discounted tattoos. Coach Jim Tressel has asked that he also be suspended for the same span for not reporting the players’ involvement. Star quarterback Terrelle Pryor and four others acknowledged they sold rings, trophies and apparel in 2009. • Wozniacki, Sharapova advance at Indian Wells: Top-ranked Rafael Nadal defeated big-serving Ivo Karlovic 5-7, 6-1 7-6 (7) to reach the BNP Paribas Open men’s semifinals at Indian Wells, Calif., for the sixth consecutive year. Top-ranked Caroline Wozniacki advanced to the women’s semifinals when Victoria Azarenka retired with a hip injury while trailing 3-0 in the first set. Wozniacki next plays Maria Sharapova, who outlasted Peng Shuai 6-2, 5-7, 6-3 to reach her first semifinal of the year after missing the last five weeks with a viral illness. • Judge bars Bonds’ voicemails from perjury trial: A federal judge barred the jury at Barry Bonds’ perjury trial from hearing angry voicemails the home run king left with his mistress during a stormy nine-year relationship. Prosecutors wanted to introduce the voicemails to show that Bonds was experiencing so-called “roid rage” when he left the messages demanding to know the whereabouts of Kimberly Bell. U.S. District Court Judge Susan Illston said that the voicemails had little relevance to proving Bonds lied when he denied knowingly taking steroids. Illston said she believed prosecutors were trying to get the voicemails into the trial for the sole reason of denigrating Bonds in front of the jury.